It’s not particularly surprising that Jay Odjick received his first rejection letter from a mainstream comic book publisher (Marvel) at the age of 10. Jay Odjick: “As a kid, I really dug Spider-Man – I’d read anything, but after a few years started to gravitate a bit toward the darker characters. They kind of fit more closely with my experiences and environment. Needless to say, Odjick and Marvel had some divergent world views. Odjick was an Algonquin kid living off-reservation in a decimated neighborhood. A young Jay Odjick with his Mom in Rochester, NY. Jay: “I was born in Rochester, NY – which is where my mother is from. My father, like many other guys from Kitigan Zibi, left the reserve very young to find work, and he ended up seeing a good chunk of the upper East Coast. I think he left home at like…13 or 14. There were quite a few people from my res working in the Rochester area – so he met my mother there, they got married and I was born in the US… like a block away from a comics store. Fast-forward 25 years. Even if Jay was then the successful comic and cartoon creator he is today, Marvel would likely continue to sneer at his work. Why? Perhaps because it refuses to fit any mainstream indigenous stereotypes that industry leaders like Marvel and DC have made millions depicting for decades. Jay: “I didn’t come across too many comics that featured many native characters as a kid – I think my first real exposure to any were in some Westerns – and then at some point, Apache Chief from Super Friends (not comics, but still). We had moved [back] to the res after leaving Rochester and I remember thinking, ‘Okay, this guy is very much unlike anyone I know – or anyone living on my reserve’. I never really felt like I saw anyone in comics who looked or acted like any native people and, as a kid, I found it weird even if I didn’t understand why. In his twenties, Jay created and began producing The Raven while continuing to live in Kitigan Zibi. This was his first foray into publishing comics. The life of an unseasoned self-publisher is one of constant trials—from the printer to the comic shop. While Jay struggled to create, produce, and promote the work on his own, his expenses were piling up. For his next project, he aimed for a graphic novel format, which took the pressure off the machine-gun publishing schedule of single issue comics creators (typically work reserved for an assembly-line team of comics writers, editors, artists, inkers, colourists, and promotional teams). Jay: “I was going to comic conventions as a publisher around this time and met up with Arcana‘s Sean O’Reilly – who had a booth next to me at a Toronto Comic Con, and we struck up a conversation about my book and he said he’d be interested in publishing a graphic novel. Kagagi: The Raven, graphic novel available through Arcana. As Odjick worked on the graphic novel for Arcana, he developed his creation. Kagagi is a native character based on Anishinaabe teachings and language. The project received critical acclaim, and Kagagi was approached by the Aboriginal Peoples Television Network (APTN) for a kid’s TV show adaptation. As any creator knows, the task of character design is a meticulous one, requiring careful contemplation. 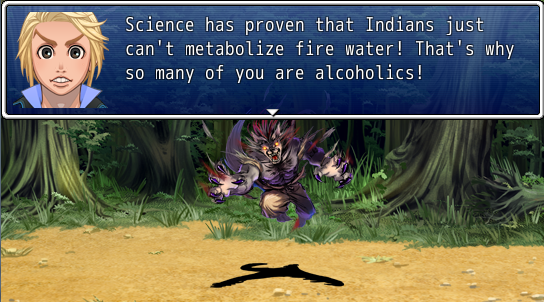 Here, Jay made some interesting decisions with regard to Kagagi as a realistic representation of indigeneity. Jay: “In terms of visuals, I decided to steer clear of the stereotypes or tropes we tend to see associated with native super-people. I didn’t – and still don’t – believe a super person in buckskin will resonate with younger readers or maybe even readers my age. A key element in using dynamic media like comics, cartoons, and video games to communicate complex cultural or political information is a work’s ability to be engaging on a number of levels, from aesthetic, to entertainment to education. Odjick feels the design of the Kagagi graphic novel and TV series achieved this. Jay: “If we want to create native superhero characters who resonate with native kids, we have to speak the same visual language in the media forms they’re accustomed to. Now, the Kagagi ‘suit’ itself manifests when Matthew transforms – based on his subconscious, and what he thinks a hero should look like. It’s something I never got to explore enough in either the comic or the show, but that’s why he looks the way he does as Kagagi. He’s a kid who grew up reading comic books and watching cartoons and playing video games! Jay acknowledges that both inside and outside of his comic creations, it’s a fine line for indigenous youth to navigate society’s expectations of them—expectations that can be either helpful or harmful. Settler portrayals of indigenous comic book characters have traditionally catered to the male white child’s imagination of what is indigenous: think Daniel Boone, Davey Crocket, and The Last of the Mohicans. A part of the imagination in colonial North America is that settlers are absolved of guilt for their complacency in genocide, because they wish to adopt an indigenous custom here or a style of dress there. All the while, indigenous artists and creators are ignored. Jay: “[The line goes…] ‘It’s ok, we are showing respect!’…Right. Ultimately, it burns down to that critical question, currently searing the mainstream comics industry: regardless of character diversity, who has creative control over the design of the characters, and the stories? Jay: “I can’t speak to much beyond my own community – but people in Kitigan Zibi have really embraced Kagagi and especially the series, because even if we aren’t delving much into culture and myths, we have created a show that exists in English with a mix (20%) of Anishinaabeg and with a language version completely in Algonquin as well. My hope is that if kids like the show, it maybe helps them to learn the language. Jay at the school he attended as a kid – coming back for a visit and to launch the Graphic Novel section of the Library, 2014. Learning from previous struggles as a self-publisher, Jay worked to make Kagagi a real community effort. Algonquin voiceovers were done in Kitigan Zibi, with Anishinabeg translations read by local teachers Joan Tenasco and Annette Smith. While most of the voices were from his community, Jay was happy he was able to bring in cast members from neighboring Barriere Lake. As he was already on tight deadlines and budgets, he paid for the Algonquin translation out of pocket, recording the voiceover work himself. But in terms of finding a larger community of indigenous comic creators, Odjick feels that there remains a great deal of room for improvement and growth. Jay: “I think the fact that I write and draw my own stuff maybe has a bit of an isolation factor! When I was starting out in comics I was unaware of literally any other Native creators. I was very much trying to learn about the comics industry, about publishing, publishers, who did what, etc. 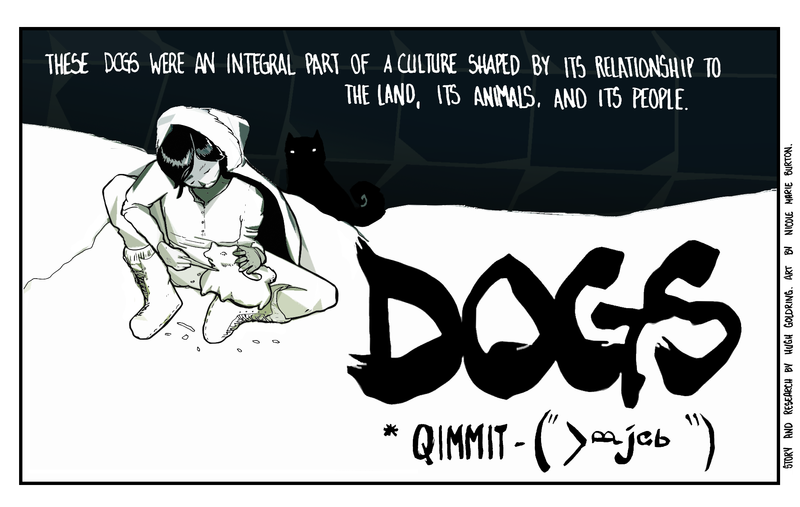 Now, I’m seeing more and more Indigenous comic creators, which is awesome! 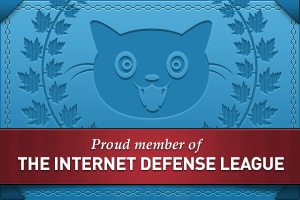 I’m stoked about that – but have only been in contact with a few. 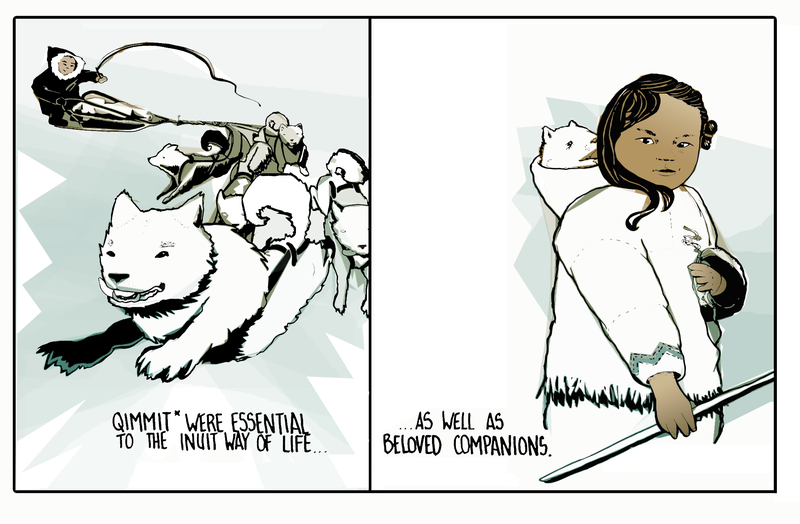 I drew a story adapted by Niigaanwewidam Sinclair that’s in Graphic Classics’ Native American Classics, published a few years ago. 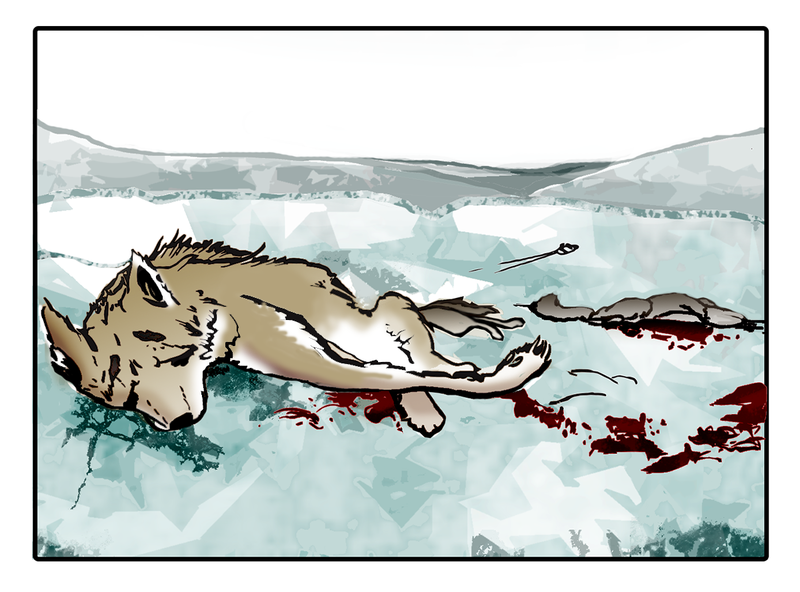 I’m taking part in the Moonshot anthology with First Hunt, which I illustrated and co-authored with my brother, Joel. 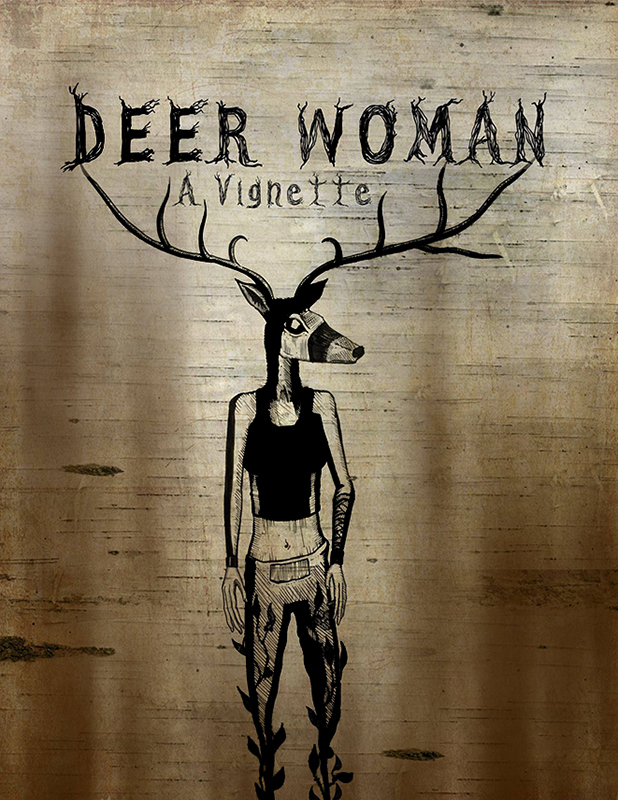 It’s a story about the role hunting played in Anishinaabe life back in the day, and illustrates some of the pressures that must have come with it. Odjick considers the Kagagi TV series a major victory with a dynamic and lasting impact. It allowed him and his community to create a powerful learning tool for language, and it convinced his community to be open to new forms of media as a way to pass on traditional teachings (Odjick is very proud that there is now a graphic novel section at the K.Z. School Library containing some 200 titles). Kagagi: The Raven airs on APTN every Sunday at 10 am, and is available online at aptn.ca/kagagi! More information: To see the full preview, visit the Graphic History Collective website. Art has a way of connecting us to ideas, or, in this case, a time in Indigenous (and Canadian) history recognized or known by few. 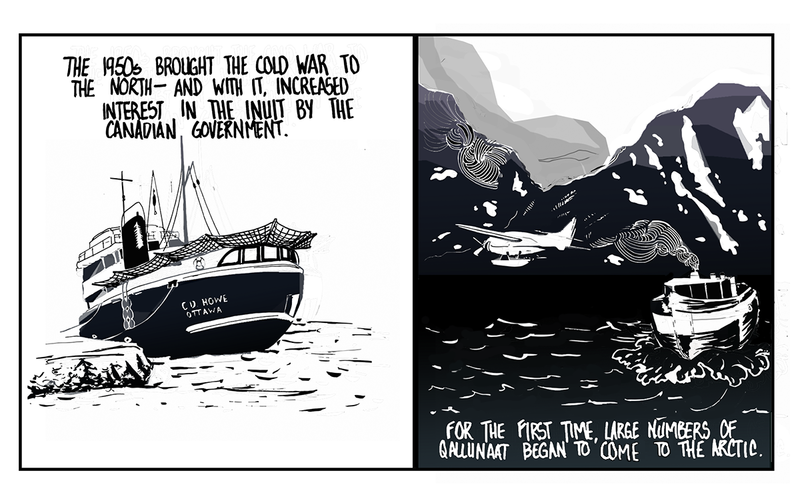 Writer and illustrator Tania Willard (Secwepemc Nation) uses relief print panels in captivating black-and-white to draw out a nonfiction narrative of economic survival. The comic was co-written by Robin Folvik and Sean Carleton with the Graphic History Collective. 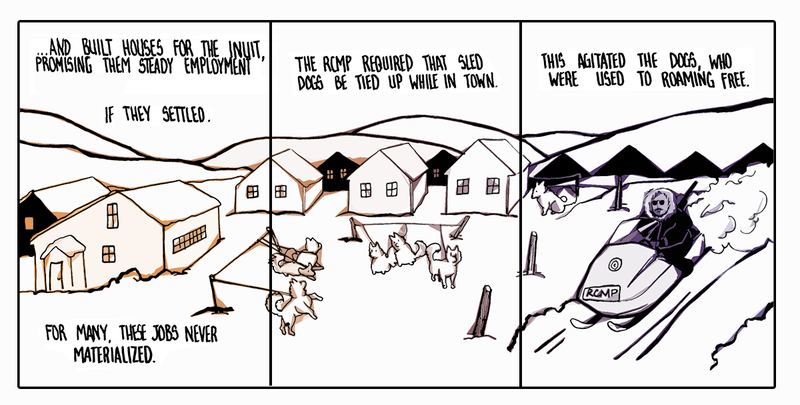 A quick geography lesson from the comic: Burrard Inlet connects the traditional territories of xʷməθkʷəy̓əm (Musqueam), Sḵwx̱wú7mesh (Squamish), and Səl̓ílwətaʔ (Tsleil-Waututh) Coast Salish First Nations in what is today known as Vancouver, British Columbia. It’s in area perfect for hunting and fishing, and easy-access resource exploitation. The narrative itself is straightforward, and easy enough for elementary-aged readers to comprehend: Colonizers came in, territory was acquired, resources were identified, brief working relationships were achieved until guaranteed unfairness ensued, Indigenous people protested, protests were squashed by excessive force and bullying, and a legacy of underemployment began. For context, it’s important to note the labour environment in modern times. Quick summary: It’s not good. According to the Canadian Labour Program, workforce disparities for Aboriginal people include an over-representation in low-skilled occupations, and under-representation in managerial and professional occupations, according to the latest statistics. At 18 percent, the national unemployment rate for Aboriginals is three times the rate for non-Aboriginals; comparatively, the employment rate is just 48 percent among Aboriginals. If that weren’t bad enough, the wage gap continues to widen between Aboriginal and non-Aboriginal full-time workers; the latest numbers show Aboriginals make 73 percent of their non-Aboriginal counterparts’ incomes ($37,356 to $51,505). Dismal. The government attributes this gap to lower educational attainment for Aboriginal people. Using that logic, the government itself is then responsible. Consider the history of oppression faced by Canada’s indigenous populations, in particular the education system dedicated to first wiping out Aboriginal children in boarding schools and then inadequately teaching (or simply refusing to teach) Aboriginal history, accomplishment, and impact on modern-day Canada in school curricula. In this light, one sees clearly the role and connection the government and its policies played in the contemporary Aboriginal workforce outlook. But Willard’s comic flows matter-of-factly through basic labour moments from the mid-1800s through the 1920s and early 1930s and stops there, although the last panel notes how longshoremen continue to work the inlet today. The bulk of the narrative discusses how Indigenous workers unionized themselves to varying degrees of success. Unsurprisingly, when the highly skilled Indigenous longshoremen went on strike in 1918 to earn 5 cents an hour more, non-Indigenous workers swept in and took those jobs, which left the tribal people of the inlet in desperate situations. I appreciate that the text isn’t pumped full of stylized drama. It’s very, “Just the facts, Ma’am.” In an era where much of what non-indigenous people know about us is less fact, and more fantasy, the no-nonsense style of writing rings with authenticity, and is a breath of fresh air from shape shifters or mutants. Reading as an outsider, the story Willard is telling feels unfinished, and perhaps that’s purposeful. However, the title (‘Fighting for the Land’) leads readers to believe there will be some sort of reclamation (or attempts, anyway) by the longshoremen or tribal communities. Outside of “processing ancient timbers,” there isn’t really anything land-based happening. Regardless, the lino-cut drawings are the star of this show, and I went back over the panels again and again, because previously missed camouflaged images and symbols kept swimming to the surface with each pass. With Indigenous history – and ours being a history traditionally told through stories, not written words – perhaps this is the point. 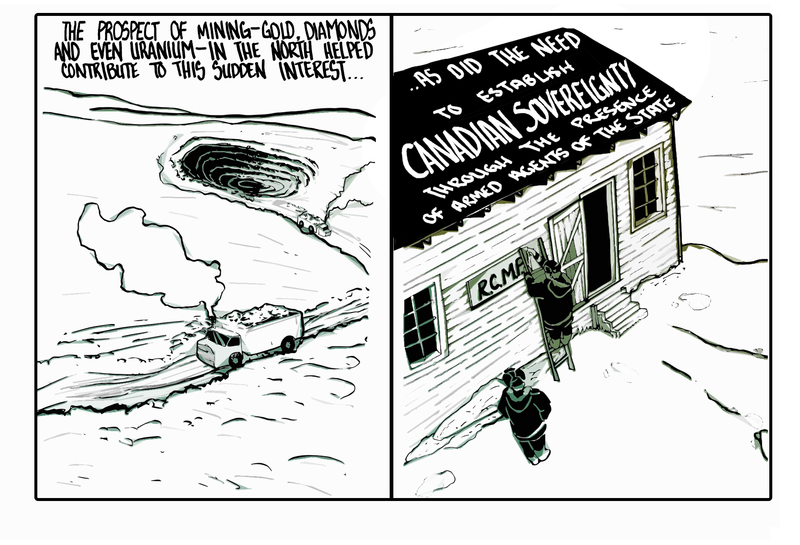 The comic is part of an anthology, Drawn to Change: Graphic Histories About Working-Class Struggles (to be published in 2016), which will focus on Canadian labour history. Richard Van Camp, a Tłı̨chǫ writer from Fort Smith, Northwest Territories, based ‘Three Feathers’ off an incident in his town. There were three young men who robbed a number of residents of the town, including him. When they were caught, they were sent south to serve two years in prison. In ‘Three Feathers’, a Sentencing Circle sends the boys to spend nine months living on the land with some of the community’s elders. The difference in their experience is profound. 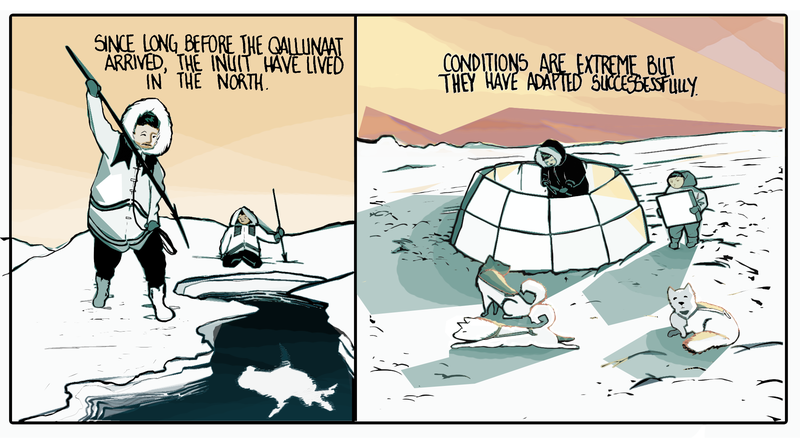 The comic opens with the boys returning from their time on the land. This beginning sets the tone for a non-linear narrative structure that challenges the reader to piece the story together while also making sense of what is, to most settlers, an alien approach to justice. This echoes our experience of learning about criminal incidents where we are often too quick to make assumptions based on a few snippets of information. 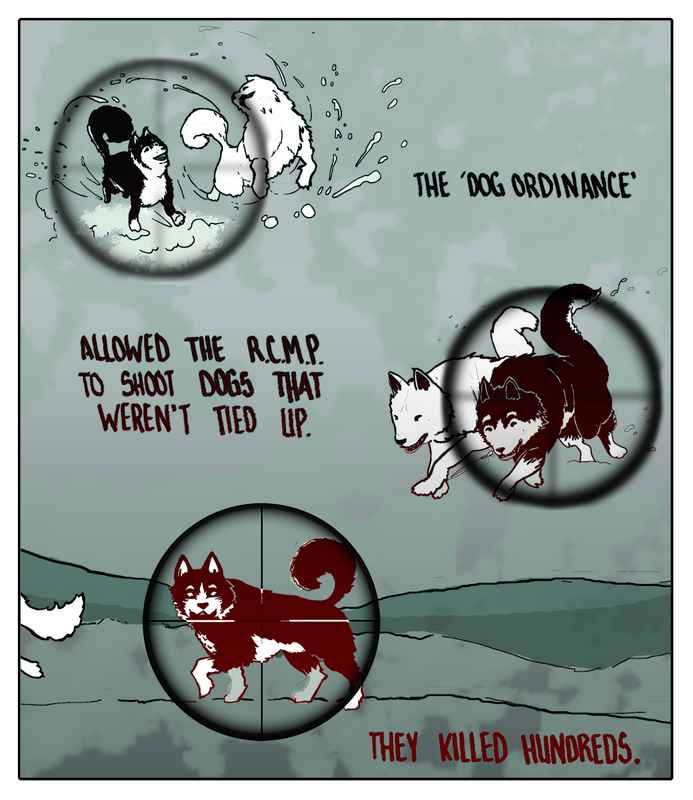 The comic charts the events leading to the sentence, the experience of the boys on the land, and its ultimate effect on them. In doing so, it helps us piece together the story of how the boys came to be at odds with their community. ‘Three Feathers’ paints a familiar portrait of the challenges faced by indigenous communities: children without parents, families struggling with addiction, and youth alienated from their traditional culture. But Van Camp, unsurprisingly, never stoops to caricature. His characters are emotionally complex, possessed of agency and sympathetically rendered. He provides a good answer to the question ‘Why does it matter that indigenous people write indigenous characters’? His portrayal of a deaf character, one of the boys sent to the land, is also nuanced. He isn’t reduced to his disability or played for laughs but is allowed to suffer from the same anger, frustration and imperfection as his peers. The comic is not without its faults. It is not as long as it might be, and as a result we are not given much time to learn about the young men or their community. Similarly, though there are some aesthetic styles that benefit from the use of black and white, this is a comic that would have benefited from colour. Still, the sparse use of text accents the art and puts the environment in the foreground, particularly when the young men are out on the land. Given the moral and spiritual importance of their environment this is a good aesthetic choice. I don’t want to give away the ending. I will say, however, that I was surprised by it, though it reflected the moral arc of the story as a whole. The tale is one of restorative justice, of the capacity of a community to heal its wounds together instead of discarding people who behave unacceptably. It is understood from the outset that the boys have caused harm partially as a result of the harm they themselves have experienced. Their rehabilitation is not rooted in high-minded moralizing about human nature but in the very personal compassion and willingness to forgive shown by their community. How radically this differs from our colonial conception of justice! For many Canadians, justice is inseparable from retribution. There is even still a surprising enthusiasm in Canada for capital punishment. The idea that ‘criminals’ could be sent out onto the land to fish and camp with the elderly probably sounds like a vacation to your average settler. Even successful experiments with rehabilitation, like the Kingston prison farm, end up up in the scopes of politicians looking for a soft target. Activists on the left sometimes like to imagine that they are above this kind of justice. They champion prison abolition and talk gravely about police corruption. But, in practice, I think most radical communities end up practicing a kind of ostracism, seeking to exclude people who transgress against the values of the community past a certain point. I’m not saying we can’t protect our communities from toxic people, privileged jerks who never shut up, or occurrences of sexual violence. But what I do think is that restorative justice looks a lot more ‘protecting our community’ than the ostracism that contributes heavily to activist turnover. That is not a comfortable truth for people whose social circle is a line drawn in the chalk of moral certainty. But uncomfortable truths are a powerful thing in the right hands. All I could think in reading this comic was ‘if only it worked that way for us’, …whoever ‘us’ is. 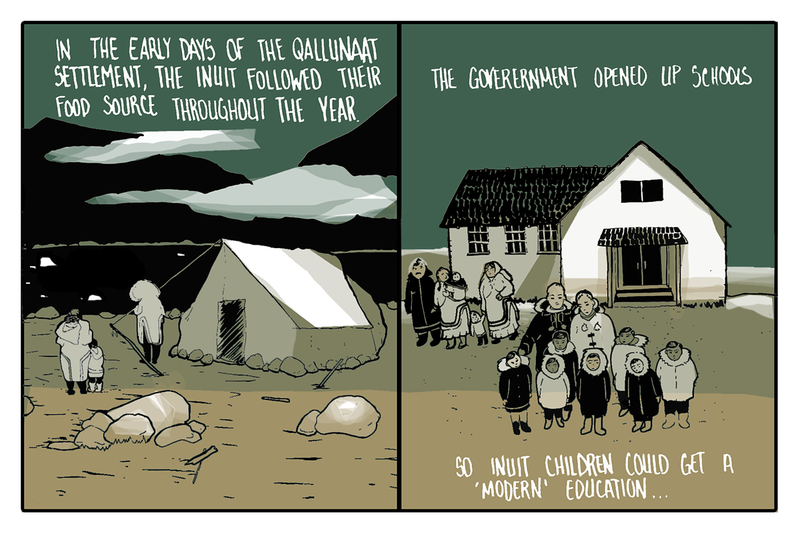 There is a terrible need in North America today for education about the history of colonization. As settlers advanced notions of Euro-centric “progress” for centuries, the catastrophic effects upon the first peoples of the land–from outright war to enduring forms of cultural genocide–were hardly noted, even by those claiming to possess a conscience. Now, like the raven, indigenous people and settlers alike are thirsting for this knowledge, and creative minds are coming up with new, innovative ways to bring generations of stories from the margins to the mainstream. We were honoured to chat with David about his vision, his work, and his plans for the future. All illustrations are courtesy of artist Scott Henderson and Highwater Press. Ad Astra: Looking over the stack of comics in front of me, first and foremost, I see the work of a storyteller. What brought you to this line of work? And secondly, what brought you to comics to tell many of those stories? Dave Robertson: I suppose it’s a combination of three things: education, personal history, and writing. I grew up disconnected from the side of my heritage that is Cree. My parents were separated when I was very young, and I was raised by my mom in an upper-middle class neighbourhood. She raised me and my brothers well, but because my dad wasn’t around a lot, I wasn’t exposed to First Nations culture or history. So, I grew up exposed to the kind of ignorance we still see today. A lot of racism, either experienced directly or indirectly. I ended up having a low sense of self-worth. I saw myself how others saw indigenous people. Then, when my parents reconciled, and my dad moved back in with us (this was over a decade later), I finally began to learn more about who I was as a First Nations person. So, it’s been a long journey, learning about myself in that way, and growing a strong sense of pride through knowledge. Now, nine years ago, I wanted to do something so that other kids could be exposed to real history and real culture. I felt like, if I could bring something into schools that would engage kids with truth, it would help in some way to fight back against the difficulties we still see in our country. Education is knowledge. My parents are both educators, that’s probably where that came from. Now, I’d written since I was in grade three, so I knew I wanted to write something. And because all I ever read when I was growing up was comic books, I thought it would be an amazing way to get kids engaged and excited with history and culture. That’s how I got into writing graphic novels. My thought was: if you gave a kid a comic book and gave a kid a text book, which one would they choose to learn from? Always the comic book. The thing is, after they read the comic book, they want to read more about the subject. So they read the text book afterwards. DR: They call that “Visual Permanence”. See, at first it was: ‘Comics are cool; let’s do this.’ After that, I realized all the technical ways they are so effective. For example: reading comics connects with us in an almost primal way. And that’s because we used to communicate through pictures, not words. It’s the most ancient way to story tell. DR: I don’t disagree with that. At the launch of my first graphic novel, ‘The Life of Helen Betty Osborne’, Murray Sinclair said that while we have an oral tradition, we now are finding new ways to pass down our stories to future generations. One of those ways is through the sequential art medium. It’s also through art, dance, music, and other forms of writing. But I think graphic novels and comics are the most effective. And I think that’s due to the format itself, and the visual nature of the medium. And it goes back, again, to how ancient this form of communication is. It’s taking it all the way back to wall paintings, the first way we communicated with each other and passed down stories. The old always becomes new again. AA: You mentioned presentations in the classroom. What age groups do you work with? DR: That’s the other thing with comics. For the same book, I’ve been to visit a grade four classroom, a junior high classroom, a high school classroom, and I’ve guest-lectured in university classrooms. They are the universal medium. There are reasons for this, too. Because of their visual nature, they connect with struggling readers or readers at lower skill levels. But because [the good ones] often have complex narrative structures and character development and so on, they connect with sophisticated readers as well. What novel can do that? AA: There is, understandably, a real sense of loss and despair in a lot of the characters you depict in your work. A few colleagues, indigenous and settler, have noted that the work is a difficult read emotionally, sometimes almost paralysing. What do you see as the goal of bringing these uncomfortable, even triggering histories to comics? Do they present any difficulties in groups, or working with people who have experience similar forms of trauma? DR: Sure, they are hard to read. I remember passing by two teachers who were shocked by the scenes in Ends/Begins, for example. But they were shocked in a good way, because they recognized the value in bringing history to students in such a real way. But, I should add, in a way that is sensitive and respectful. But these stories need to be told. People need to know the history, and the uncensored history. That is the only way there will be an understanding of the historical impacts on First Nations people in this country. In terms of how to deal with that pain, some of that is in the hands of the educators who are sharing the work. If you are sharing it with kids who are second generation survivors, or survivors themselves, you need to ensure you have supports in place to deal with trauma. If you are showing this to non-indigenous people, you need to prepare to continue the dialogue the book begins, bring in a speaker, bring in supplementary texts, etc. Teachers often say: how can I bring this into the classroom? The content is too difficult. I say to them, consider what your students are inundated with today through media. The violence we see on television. The Walking Dead, for example (which I love, by the way). Yet what you are bringing them in these works is reality, history, and things we all, as Canadians, need to know. There is just too much ignorance out there not to find the best ways possible to educate. AA: Can comics and cartoons be problematic or trivializing when exploring violent and traumatic histories? How do you feel about settlers attempting to tackle these subjects? Is this part of a larger legacy of settlers dismissing the need for consultation in their “indigenous solidarity” activism? DR: Well, settlers need to ensure they are doing things right if they are addressing histories of First Nations people. They need to consult with elders, indigenous peoples, and do the research, and research from the right resources. You know, Scott Henderson is white. But he has done the work to ensure that he is depicting things accurately, and we run our work through the proper channels to ensure we are being accurate and respectful. I think comics can trivialize violence, or show gratuitous violence. But they can also explore violence properly when it’s within the context of reality. The violence in my work is purposeful because it has its place within the story and within true history. Nothing is gratuitous. So, again, educators and readers need to choose properly. Do I like settlers telling our stories? Not really. I think there is a growing movement of reclamation that needs to stay within the hands of the indigenous peoples. We just need to encourage youth to continue to get involved in telling stories. Our stories need to be reclaimed by our people, as long as those stories can be held to the right standards of excellence. AA: You mentioned you were a comics fan growing up… comics is a strange medium, where indigenous people have been very *present* in comic representations, but almost exclusively created by white settlers for a white audiences, and very much from the white imagination of ‘manifest destiny’ and other white supremacist outlooks. Did you have any native comic role models? Which characters did you like growing up, and why? DR: Honestly, I didn’t have any First Nations comic role models growing up and I still don’t. Part of the reason is that it’s still a growing medium within the First Nations community. 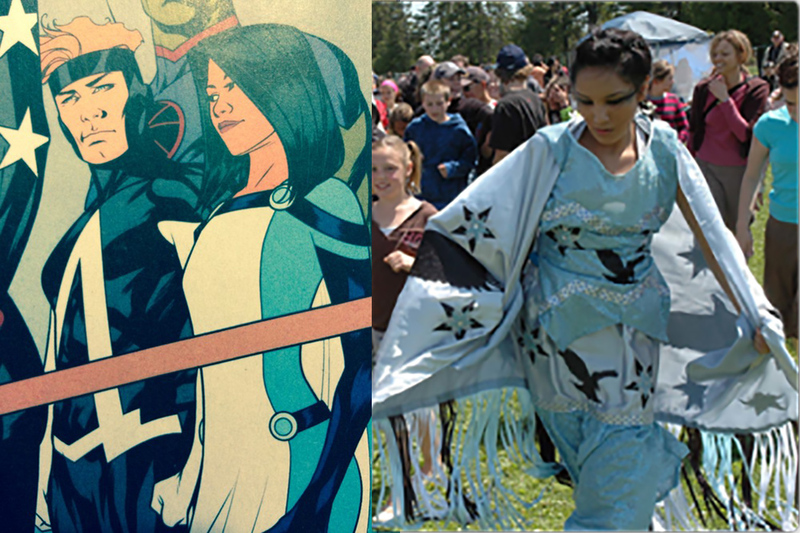 There just aren’t a lot of First Nations comic book writers out there. But, that’s changing too. You know, Richard Van Camp just did one through my publisher. The Healthy Aboriginal Network does some amazing work. There’s Red, too, which you mentioned. So, I feel encouraged by all of this. In terms of characters. I’m not sure, really. There weren’t and aren’t a lot of great indigenous comic characters either. It’s so hard to create characters without perpetuating stereotypes or appropriating culture, I guess. But I think it’s doable. I loved Elfquest growing up, that’s as indigenous as I got when I was young! Other than that, I was typically into Spider-Man and Batman. I’d like to see work done for our culture that has been done so effectively for others, like King or Maus. Riel is a great one, too. I’d put it up there. AA: Helen Betty Osborne: What compelled you to choose Helen’s story as one to tell? DR: Well, it was the first one I did. I suppose I saw in her story the opportunity to tackle several issues that were important to me, and that I felt should be important to many. Through her story, you learn about the residential school system, segregation, racism, sexism, indifference, the justice system’s treatment of indigenous people, and missing and murdered indigenous women. So, it was really a story that embodied so much of what I love about graphic novels: it’s this incredible foundation in education that allows teachers to jump off into a variety of important subjects. And, today, her story is more relevant than ever. Sharing her story allows us to talk about the epidemic of missing and murdered indigenous women in ways that effect people powerfully. When it’s real, it’s effective. Her story becomes so real through the graphic novel medium. And we suffer with her and learn from her. AA: I love the way the story is framed around grassroots activism as well. I find myself noting the misfortune of many of your characters, but they’re almost always complimented with characters that represent empowerment and agency–characteristics that are difficult to portray within the victim or survivor identity. DR: Thanks! I think, too, empowerment so often comes from knowledge. AA: What’s next for you? a) upcoming projects? b) more broadly, where do you see your work going? DR: I always have projects on the go. As you know, Betty: The Helen Betty Osborne Story is coming out in May 2015. 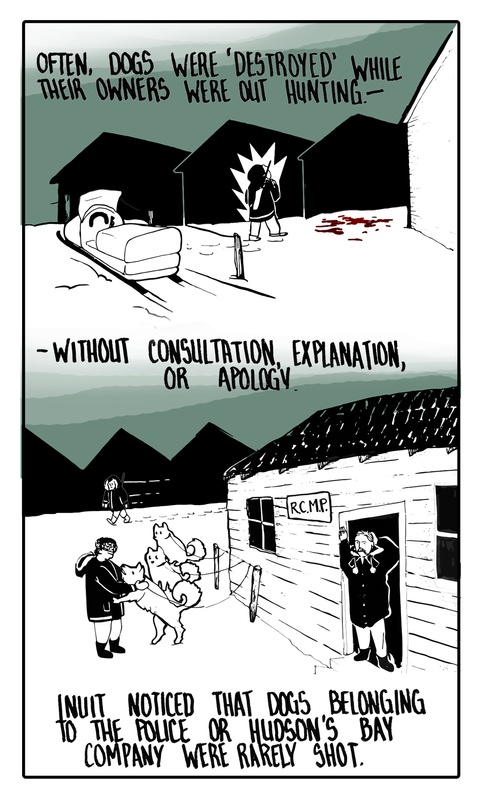 I think it’s my best graphic novel yet, and I am excited to see what it can do to raise awareness for Betty and Missing and Murdered Indigenous Women across Canada. I have another graphic novel coming out in my Tales From Big Spirit series called The Runner: Joseph B. Keeper. That’ll be out in the Fall, hopefully. We have a bunch of names on the docket for future graphic novels but no firm plans yet on who/what they’ll be about. The Tales From Big Spirit series is envisioned as an ongoing series, so we’ll keep it going forever if we can. I’m also working away at my follow-up to The Evolution of Alice (a book with no pictures!!!). I’m about 1/4 of the way through that novel. It’s about a man who plans to commit suicide but how his life changes as he gets to know his father for the first time, and how his father’s experience at residential school affected his life, and his decision to end it. In terms of where I see my work going… First of all, I want to constantly improve. I want to learn and get better and become the best storyteller I can become. That comes through writing and reading and learning from the best. I want to continue to do graphic novels, but I want to do more with them in the future. Tell stories that concentrate not just on history but on the amazing legends and myths in indigenous culture, and maybe tell some contemporary stories, create a super-hero we can be proud of and look up to. I’d love to do some mainstream work on my own terms, too. I’d love to, for example, take a crack at Spider-Man. He was my comic hero growing up. That’s in the “out there” realm, but I don’t think any dream is too big. I’d like to continue to write novels, as well. And all of that work, graphic novels and novels, all, will try to educate in some way, shape, or form. That’s important to me. Aside from that, I’d like to get into doing more work in television. I had a taste of it with my show called The Reckoner, that is currently in limbo but might see the light of day. I worked with some great writers for that show as well, like Jordan Wheeler and Sara Snow. I’d also like to write movies one day, when I have time. So, that’s what I hope for my work going forward. I just want to continue to evolve, continue to get better, and continue to challenge myself. We do all of that by taking risks. For me, those risks involve stepping outside what I might be known for, and trying new things. Many thanks to Dave Robertson for making himself available for this interview! Questions and comments to David are welcome below, through the WordPress commenting form. Here at Ad Astra, our focus is on comics. Hey, it’s in the name. But we are into political comics because we think they’re a great way to connect people with issues they might not otherwise have the time or the energy to learn about. We often have joking conversations around the office about what a social justice video game might look like. If we had the talent and resources to create one, we definitely would! Without any formal training as a game designer, Chelsea Vowel has leveraged a simple set of game-­making tools to create a promising effort at social justice video games! It is simplistic, lacking in skill progression, ridden with bugs and built using software that produces Super Nintendo era graphics. As a video game, the “Idle No More: Blockade” leaves much to be desired. But that’s not really the point, is it? “Idle No More” takes you on a journey to learn about indigenous culture, challenge racist European myths and fight to defend traditional land rights! Your aim as the player is to prevent the construction of the Enkoch Pipeline over your sun dance field by rallying land defenders to confront the company on site. In a medium where overt social justice objectives are rarer than uncooked sirloin, this is a welcome prelude to possibility. Framing the battles as confrontations with racist settlers was an inspired stroke. 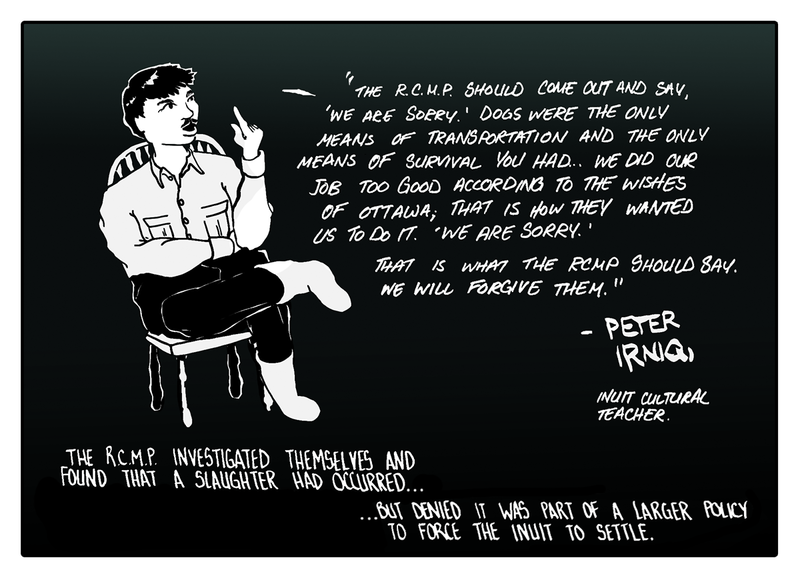 The player is confronted by white people complaining about “free houses”, “drunk Indians” and “blocking economic development.” The last boss is an RCMP officer who asserts the death of indigenous nationhood and insists the treaties extinguished their titles. 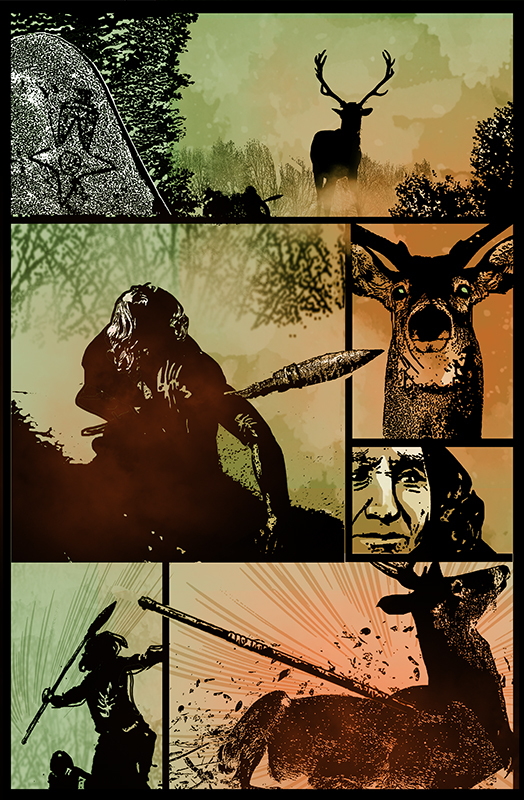 All the enemies are represented as monsters from traditional Cree stories, helping to connect cultural memory to contemporary struggle. But the able player responds with statistics, history lessons and a good measure of sass. If you don’t have to fight the hipster girl asking about wearing a headdress to a Coachella festival, you kind of wish you could. This is the value of “Idle No More” as a game. 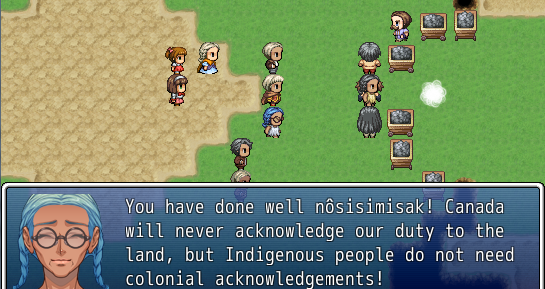 By making you an indigenous protagonist struggling to defend your land rights, the game encourages players to identify with the struggles of indigenous people. The first time I died in “combat” while educating an ignorant settler, I paused and reflected on how exhausting such confrontations must be. Seeking allies and finding ignorance, appropriation and patronizing cluelessness, I grew increasing frustrated. I was particularly annoyed by a “book of aboriginal law”, left with the elders by Enkoch representatives. You can take the book, but [SPOILER ALERT] using it on enemies only heals them! Which makes perfect sense when you think about it. One of the most striking features of “Idle No More” is its emotional range. “I laughed, I cried” is the old cliché. In twenty minutes, the game had me doing both. I was all crystal tears, I don’t mind saying, at the prospect of a pipeline going through the sun dance field. And damned if I didn’t crack up when the character looked at a book shelf and exclaimed “Tom Flanagan? Yuck.” There is a whole vocabulary of non­-verbal expressions associated with the oppressed: the raised eyebrow, the ‘side-­eye’, the rolling eyes or the apathetic shrug. In between moments that are genuinely funny and those that are painfully sad, there is at once a piercing earnestness and a wry humour. 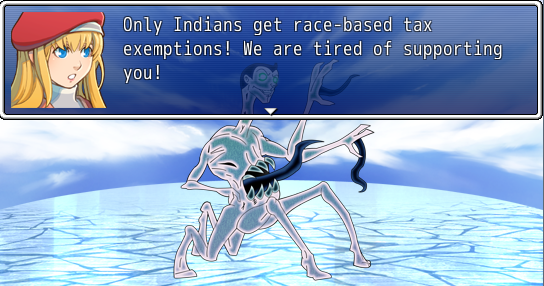 “Idle No More” is not much of a video game, but it’s a hell of a story. It seeks to demonstrate the diversity and complexity of indigenous communities, their contributions to humanity and their determination in the face of an ongoing campaign of genocide. In a game peppered with indigenous language, culture and politics, the player grows to identify with a people whose very humanity has been eroded by the narrative of our civilization. In other words, it might just help people shed some prejudice. So why not make video games that teach radical and oppressed history and culture more interesting than Big Macs and MTV? We look forward to seeing this budding art form grow. 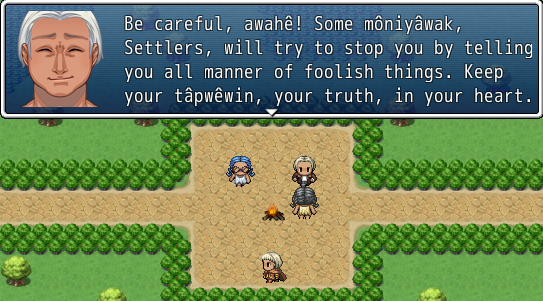 You can download the Idle No More video game and play it for yourself HERE.